Be sure to tell Dr. Patel if your child has a history of prematurity, has delayed motor development, engages in frequent eye rubbing, blinks excessively, fails to maintain eye contact, cannot seem to maintain a gaze (fixation) while looking at objects, has poor eye tracking skills or has failed a pediatrician or pre-school vision screening. 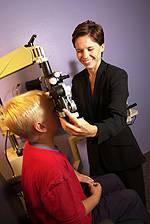 Dr. Patel will also want to know about previous ocular diagnoses and treatments involving your child, such as possible surgeries and glasses or contact lens wear. Be sure you inform him if there is a family history of eye problems requiring vision correction, such as nearsightedness or farsightedness, misaligned eyes (strabismus) or amblyopia ("lazy eye").